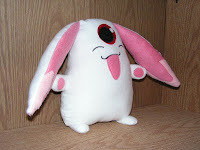 Someone on DeviantArt commissioned me to make a plush version of a Japanese manga character named Mokona from CLAMP that they had done a drawing of. Click HERE to see their drawing. After checking it out and working on a few rough draft patterns, I came up with a pattern I felt did the project justice and came up with this interpretation. 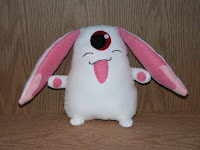 My plush Mokona measures about 10 inches tall and body-wise is about 8-9 inches across including arms, or 15 inches wide if you measure ear to ear. Perfect hugging size! I’m really happy with how it turned out! 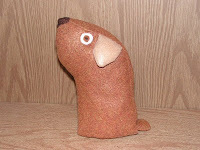 Made from baby soft flannelette and fleece with some felt features, all handsewn on. If this thing is popular, maybe I’ll make more and sell them ;) Speaking of selling things, I really need to finish my store website. 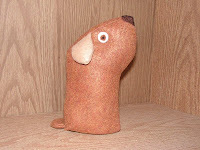 I would also like to make a few variations of the stuffiepups to show off. 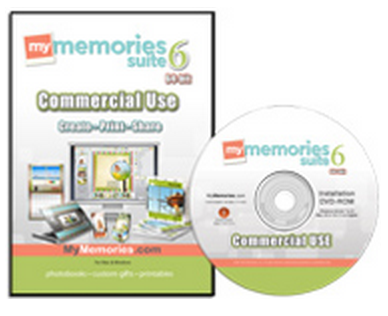 I got a bit more helpful feedback and would like to make a 100% finalized version that I plan to sell available. So far I’ve come up with some different names for each variation, and am working on their “backstory” and a way to market them. 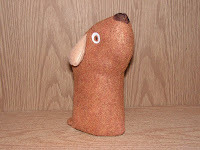 I’m thinking of a simple collar around their neck that I can then attach the little info card onto about each one. We’ll see how that goes. So after some suggestions on craftster, dA and from friends, I decided to try out arms/legs on the prototype. I was still getting the “golf club cover” vibe, so I tried adding feet, too. I think this looks much better! I don’t know what it is, but with these arms/feet he seems to suddenly have more character than a “cover for something” … I think I like the arms and feet combo best so far. And name suggestions so far have been “stuffiepups” and “logdogs”. 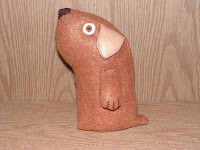 Stuffie Dog Prototype – Needs Your Input! I saw a print on a random fabric while I was browsing at Fabricland yesterday and took a pic of the print with my camera phone. Then I was thinking about it and woke up this morning with an idea in my head, so I sketched out a pattern and made this prototype. I can’t decide if I like it without arms and legs and/or if I should add arms or legs or both. It’s a little rough around the edges, but that’s mostly because he was a first go – the pattern pieces I designed myself and some of them had to be adjusted a bit when I put it all together. I imagine these _____ (insert witty or cute name for these things here) coming in a variety of colors or even patterns, based on customer feedback. Like if you wanted a black and white one, that could be arranged. Or if you wanted one with a spot around its left eye, or something. That kinda thing. So I need feedback – what do you think of these things in general? What do you think of them with/without arms and/or legs? And what kind of witty and creative name should these things have? The future of these _____ lies in your hands! I think I’m going to post here more regularly to show off stuff I’ve made in my free time… like a crafty blog :) Last week I made a tropical blue tote to give to my best friend’s sister for her wedding to take on their honeymoon. I showed a pic of it to my mom who liked it a lot and commented that she and my dad are going to Florida in May. 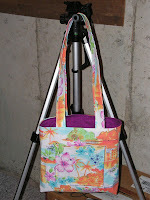 My mom’s birthday is at the end of April, so the timing is perfect… I decided to make her a tropical “Florida” tote bag for her birthday that she can take on their trip. Not too bad, eh? 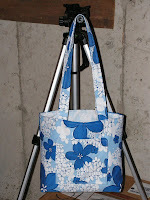 The fun part is that this is just a slightly larger version (with longer handles) than most purses that I make. I keep talking about opening up an online shop that uses PayPal to handle the monetary transactions so that I can sell custom made purses and bags like this, but I never get around to finishing it. A site has been in the works for weeks. Oh, well. One day I’ll finish it. 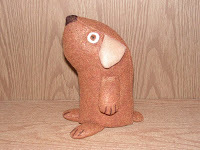 If you want to see all of my previous crafty creations, I’ve got a DeviantArt account you can browse. 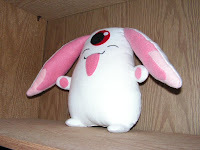 I’ll post again when I’ve made some of my in-progress projects, like little stuffed lambs (we know 5 couples that are expecting right now) or a 2D version of the rabbids from Rayman Raving Rabbids, my favorite Wii game. 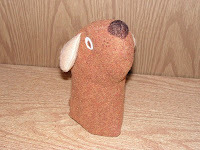 Ok I don’t know what to actually put on this blog, though I could always turn it into a crafting thing. I already have too many websites and too many blogs elsewhere, so instead I’ll just link to all of those places and you can go from there until I decide to do something official with this blog. Scoob and I’s blog/photo gallery/social calendar/etc.